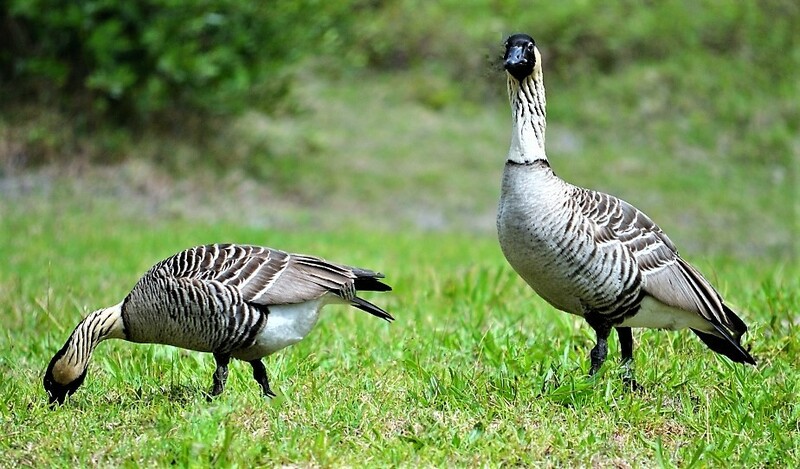 The official Hawaii State Bird is Nene (nay-nay), or Hawaiian goose. Branta sandvicensis as it is known by its scientific name, Nene is widely believed to have evolved from the Canada goose. The Hawaiian goose bears a striking resemblance to its Canadian ancestor except that only the head, bill, face and crown are black with cream cheeks, a buff-colored neck with dark streaks, barred gray/brown body and black feet. An adult Nene is about 25 inches long (around 65 cm). Wild populations on the Big Island are most frequently found on the grassy slopes of Mauna Loa Volcano and in Hawai’i Volcanoes National Park. The Hawaiian goose is one of 63 documented species of endemic birds in Hawaii. 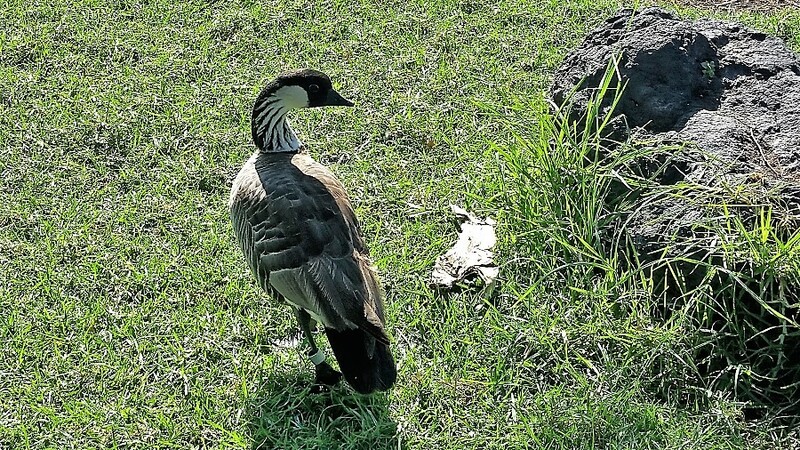 This means it is found in the wild only in Hawaii and nowhere else, making Nene the world's rarest goose. How did this happen? 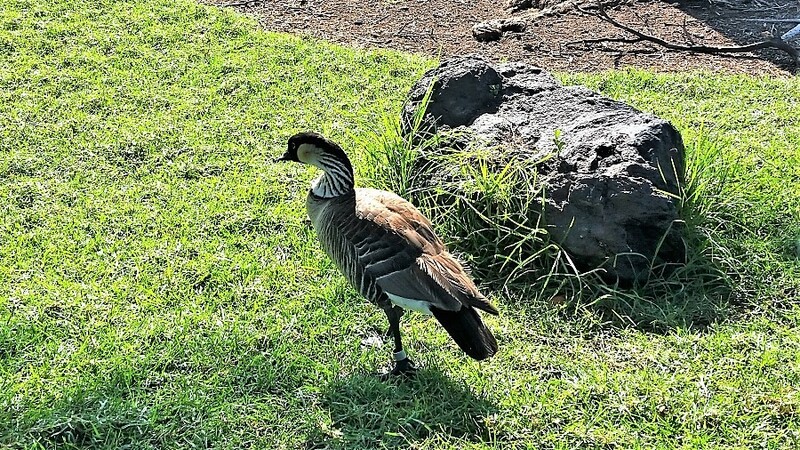 Hundreds of thousands of years ago, when the Big Island was still very young, it’s possible that a flock of Canada geese landed in Hawaii, perhaps being blown off course during their annual migration. Being in a tropical climate, there was no longer any reason to migrate. Nene adapted to its new environment, and over thousands of years evolved into an entirely new species. Without the need to fly long distances, the wings of Nene became shorter. Having also evolved to become less aquatic and more independent of wetlands, their webbed feet have given way to something of a half-webbed claw-like foot with longer toes that makes it more useful for gripping than for swimming. The adapted feet and upright posture make it easier for the Hawaii state bird to walk along the rough lava surfaces. At one point, at least nine species of geese had evolved in the Hawaiian Islands. Because they probably adapted to graze on the low-lying plants of ancient Hawaii, eight of these species were flightless, perhaps making them easy targets for early hunters. Whatever the reasons, eight of the nine species became extinct. Nene is the lone flyer, and the lone survivor. Prior to the arrival of man in Hawaii, and in particular Westerners, Nene had few natural predators. They thrived in the tropical climate on the slopes of the volcanoes, feeding on an endless supply of seeds, berries, leaves and flowers. Before the arrival of Captain Cook and crew in 1778, Nene were abundant on the Big Island. Unfortunately, hunting by humans and attack by other animals (brought by those same humans) nearly wiped out the entire population. The mongoose was particularly problematic. Several dozen mongooses were imported to Hawaii from Jamaica in the 1880s, in hopes of getting rid of rats that were destroying the sugar cane crops. Big mistake! Rats are nocturnal (most active at night), and the mongoose is mostly active during the day, so they rarely met. With no natural predators on the island, the mongoose population grew exponentially. They became an even greater pest than the rats and, with a particular liking for bird eggs, became one of the biggest threats to the native ground-nesting bird population. By the early 1900’s, a Nene population that once numbered in the tens of thousands had dwindled to a few scattered flocks. Efforts to preserve their dwindling numbers began as early as 1911, when it became illegal to hunt these unusual birds. Despite this, the population continued to decline, constantly threatened by rats, the introduced mongoose, stray dogs, feral cats and even wild pigs, all of which prey on the eggs and the young chicks. In 1957 when Nene became the official Hawaii State Bird, fewer than 40 of the birds were known to still exist in the wild. It was added to the Federal List of Endangered Species in 1967. Captive breeding and ongoing conservation efforts like the program started in Hawaii Volcanoes National Park in the 1970's, have helped to increase their total numbers, currently estimated to be close to 2000 birds in the wild. Nearly 500 reside on the Big Island. If you spot Nene during your visit, please keep your distance from these shy, regal birds. And please do not feed them.